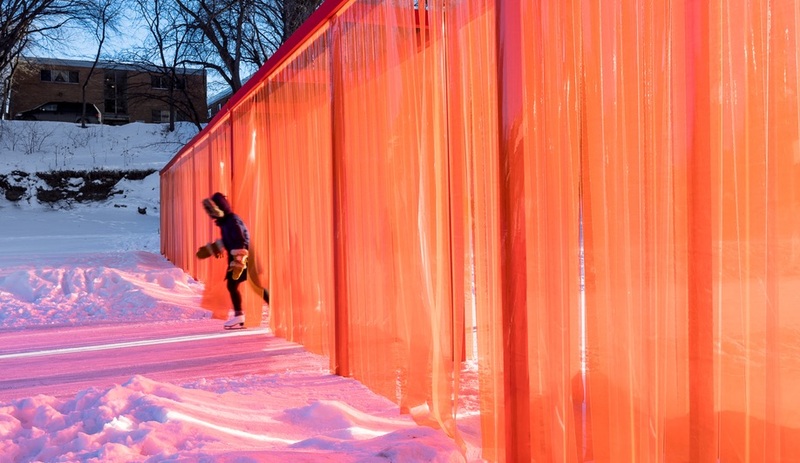 Despite snowstorms, sun, slush, and wildly fluctuating temperatures, Winnipeg’s Warming Huts had its best year yet, with installations by Anish Kapoor, Atelier ARI and Houdini Design Architects. Things got off to a good start this year for Winnipeg’s favourite winter attraction. 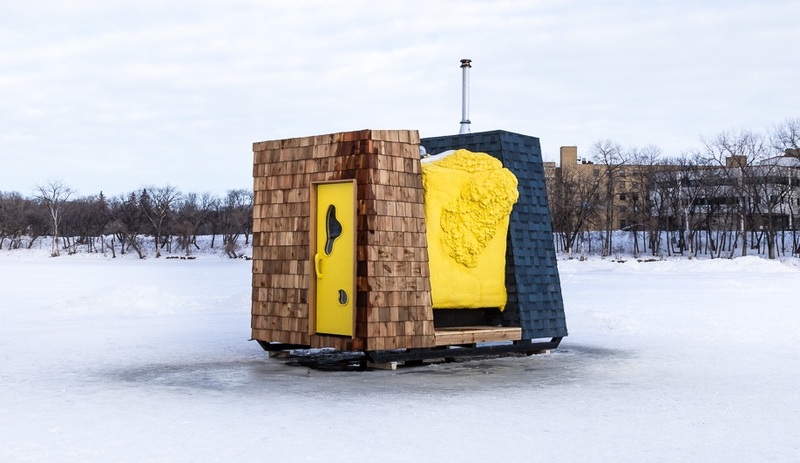 A January deep freeze had created ideal conditions at the Forks for harvesting over 72 tons of ice for Warming Huts, an annual competition that sees artistic interpretations of warming shelters installed along the frozen Assiniboine and Red rivers. 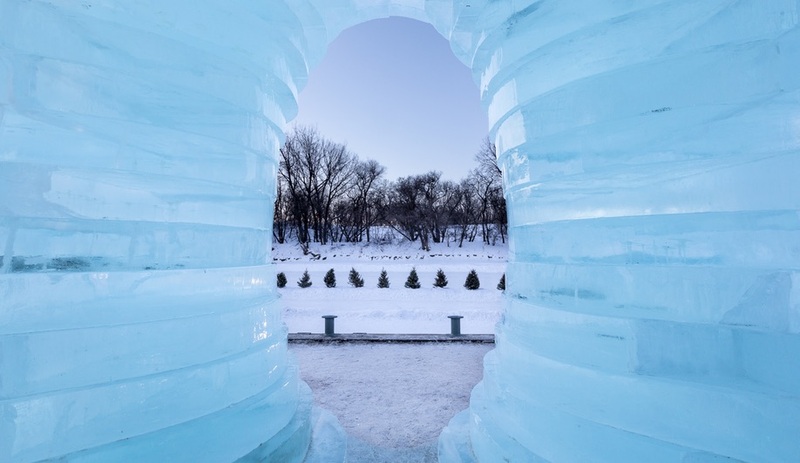 Stackhouse, designed by renowned British artist Anish Kapoor, was built from ice plucked right from the Red River, with help from Norway-based ice sculptor Luca Roncoroni. 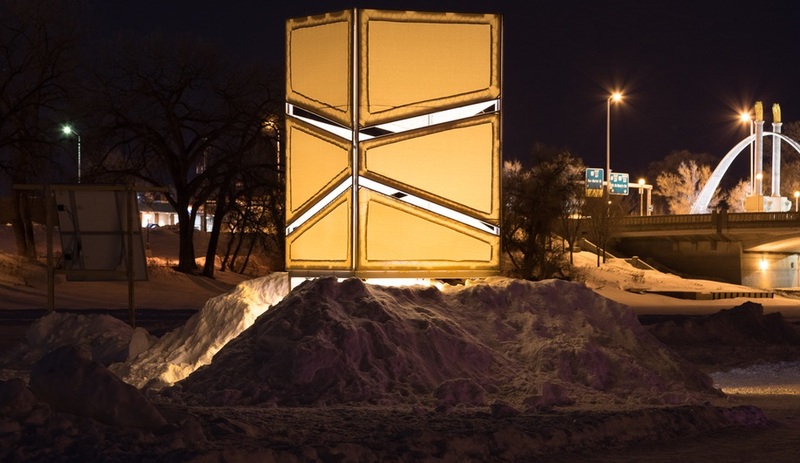 Since 2009, the Warming Huts competition has brought a series of whimsical structures to the Red River Mutual Trail each winter. 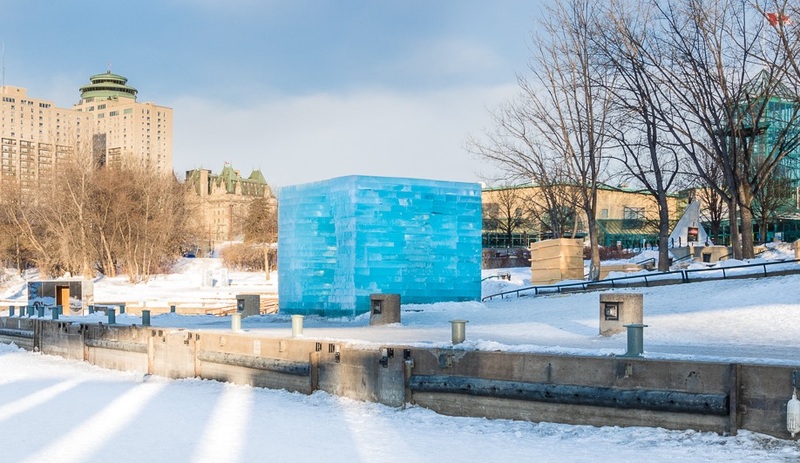 Past invited submissions have been from Frank Gehry, local architect Étienne Gaboury, and, shaking things up last year, Nunavut throat singer Tanya Tagaq (in collaboration with Winnipeg’s Sputnik Architecture). 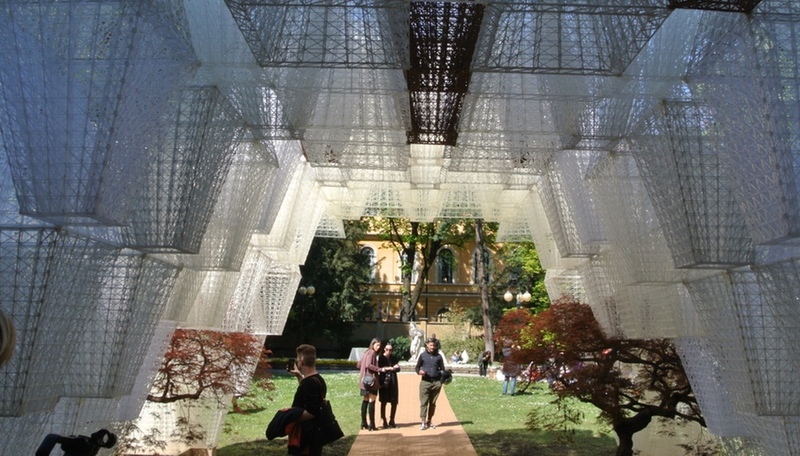 This year’s competition resulted in the selection of three winning designs – by architect teams from Halifax, Chicago and Rotterdam – for installation along the skating path, alongside Kapoor’s Stackhouse and structures by students from the University of Manitoba and Nelson MacIntyre Collegiate. 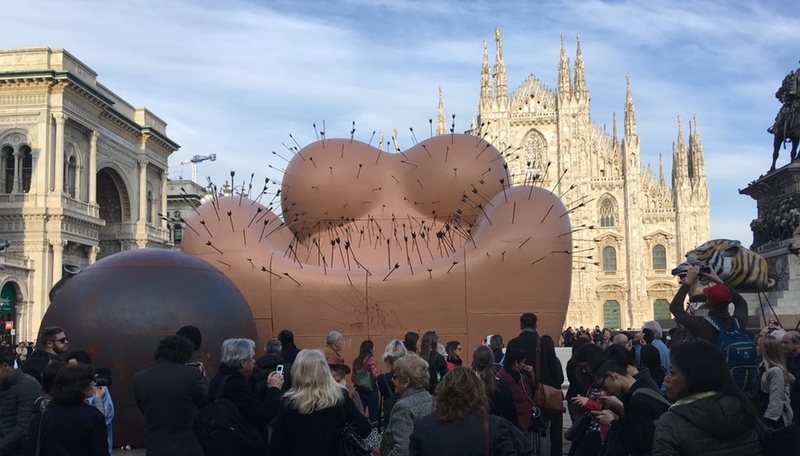 This year’s Kapoor installation was a real coup for the initiative and the city. 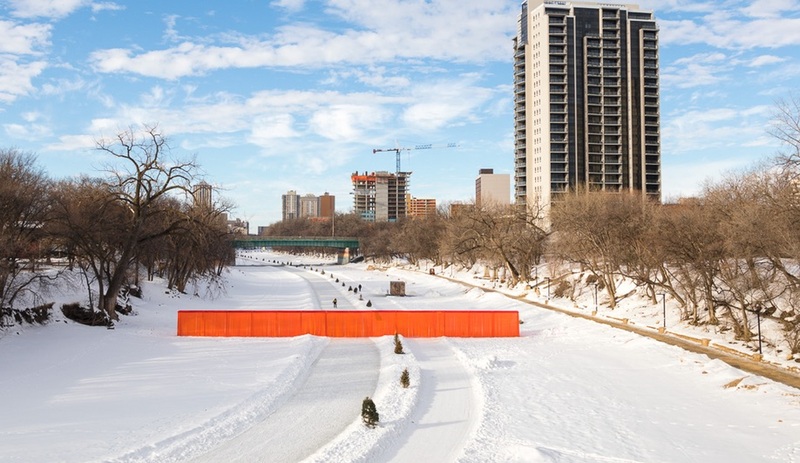 “It’s pretty cool that a niche project in the middle of nowhere is attracting some of the greatest architects and artists on the planet,” says Paul Jordan, CEO of the Forks Renewal Corporation. Like Kapoor’s best known work, Chicago’s Cloud Gate, which is constantly changing as it reflects the activity that surrounds it, Stackhouse is inherently changed by its environment. Not only does the blue ice change from dull to shining in the sunlight, but it also melts. Unfortunately, it was completed for “about five minutes,” Jordan jokes, before the cold snap ended and a warm front moved in. From Team 888, Greetings from Bubble Beach is a collaboration between two Chicago firms, Site Design Group and SMP Group Design Associates. 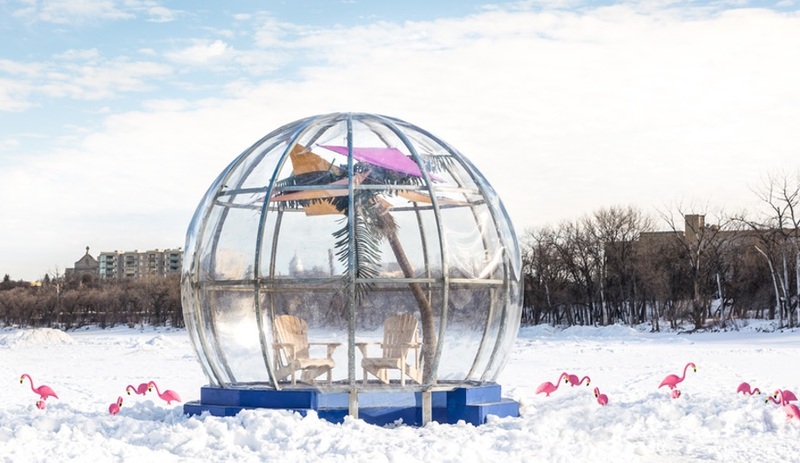 A twist on the snowglobe, it wraps a palm tree, deck chairs and a sandy patch of ground in a transparent bubble, and plants it all in a pink flamingo-dotted snowscape. 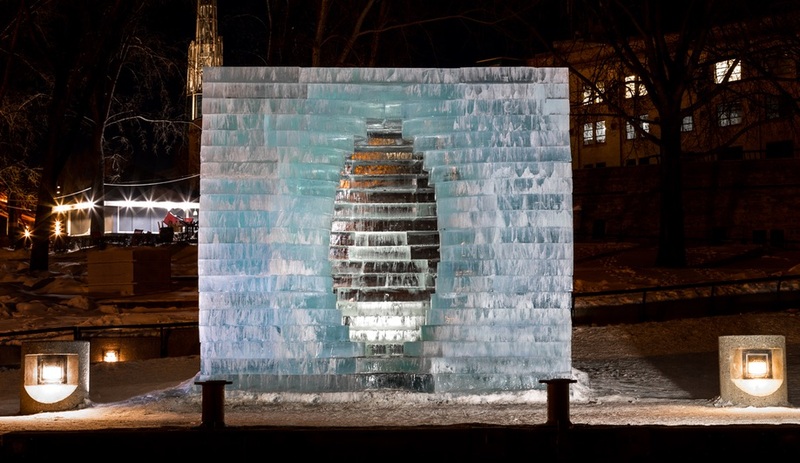 Ice Lantern, from a Halifax team made up of Houdini Design Architects‘ Lisa Tondino, Alexandra Bolen and Mathew Rodrigues, along with artist Drew Klasson, evokes a lighthouse on the shore: a shining beacon, best experienced at night. 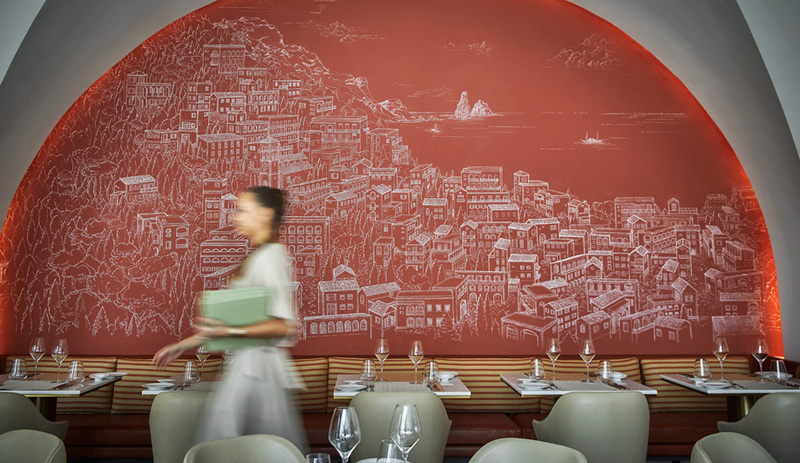 A soft glow radiates from the nylon walls and streams out from slits that zig zag the walls. Inside, these perforations frame views of the sky, as does the open ceiling. Joyce de Grauw and Paul van den Berg of Rotterdam firm Atelier ARI, riff on the world’s current political climate with Open Border, a long wall that interrupts the skating trail. Two bright red, but transparent facades form a narrow interior – an intimate space where everything takes on a rosy glow. Sean Kohil, a high school student at Nelson McIntyre Collegiate, just across the river in St. Boniface, designed On The Rails as a class project. Using 3D modelling program Google SketchUp he created this train-car-on-skids that references the adjacent rail lines, as well as the antique train cars that now house shops at the Forks. 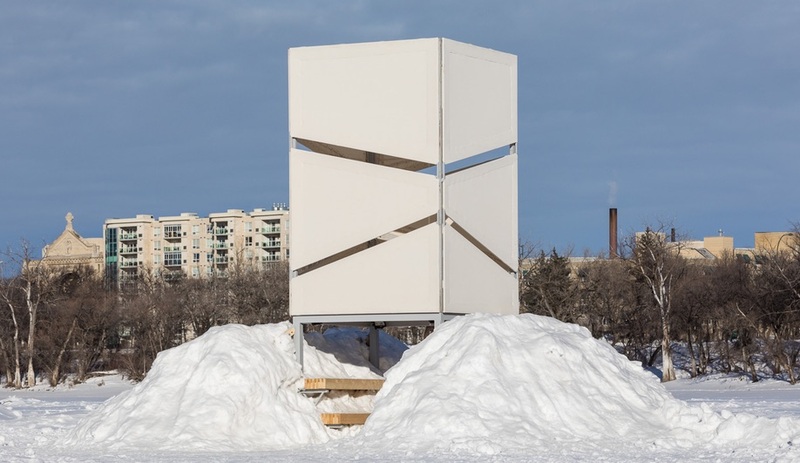 U of M’s Faculty of Architecture took the idea of a warming hut to heart this year, offering up a portable sauna that takes its design cues from both Scandinavian and Indigenous cultures. Despite the weather fluctuations that have left the skating path linking the Warming Huts alternately covered in snow and slush, 2017 was the best year yet for attendance. 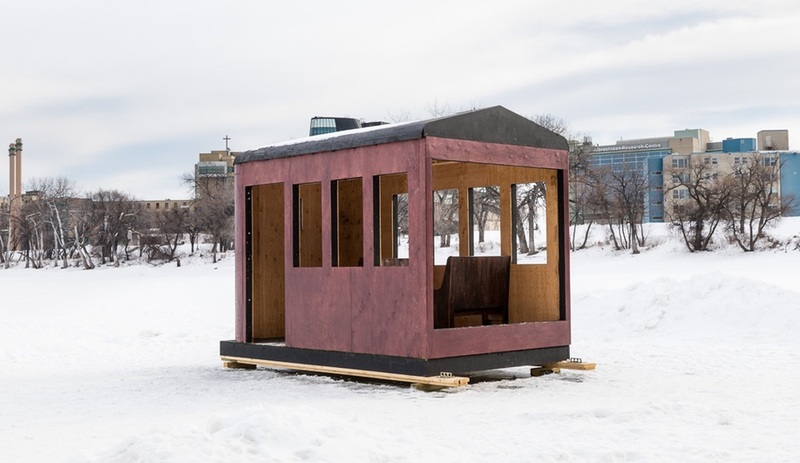 While the temperatures cut the skating season a bit short, with the river now flooding, some of the huts have been moved up to the Forks’ outdoor plaza where they’ve joined another winter intervention – the Crockicurl rink. 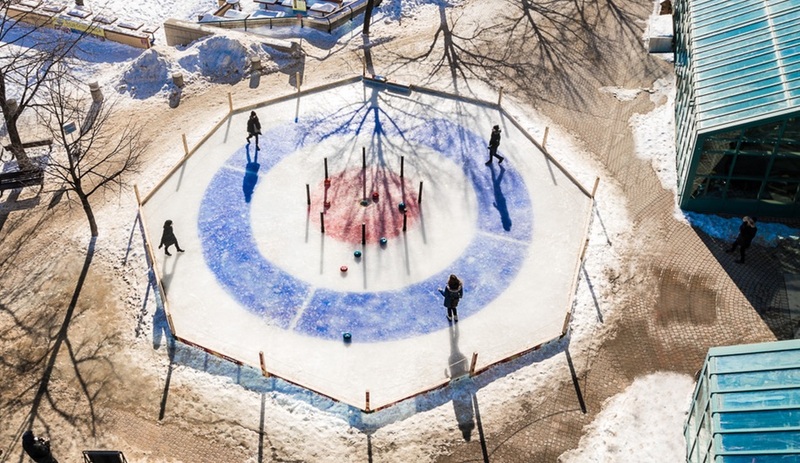 Designed by local studio Public City (formerly known as Plain Projects), the life-size game combines two uniquely Canadian pastimes: curling and crokinole.